Containing quality ingredients and no artificial flavors, Monin premium peppermint syrup is a quick and easy way to add bold flavor to a variety of recipes! Add a splash of this peppermint syrup to your popular coffee and espresso-based drinks and it's sure to please your guests. The cool, refreshing taste of peppermint will enhance the flavor profile of your hot, iced, and blended drinks without overpowering them or being too sweet. You can even mix this syrup with dairy and use it for hot cocoa, mochas, and shakes. Packaged in a glass bottle, this flavoring syrup makes an excellent addition to any coffee shop or cafe. You can also use it to prepare flavored coffee drinks or mixed drinks at your bar, restaurant, or hotel. Naturally flavored and made with pure cane sugar, this syrup has a balanced blend of flavor and aroma to instantly upgrade your signature drinks. Since 1912, Monin has had a passion for delivering premium products that simplify the beverage-making process. Their sense of innovation and creativity has led to a wide variety of flavors and recipes to suit any menu. 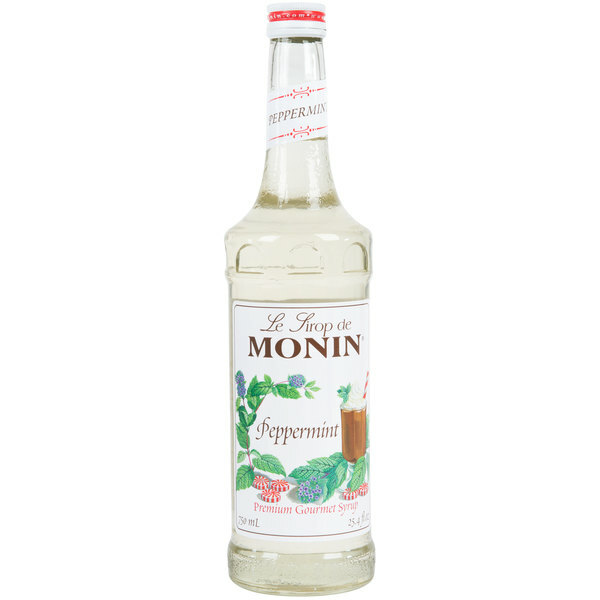 Use this Monin peppermint syrup to craft superior beverages for your guests! Very good peppermint flavoring syrup. It has been awesome with all of our holiday coffees. Since this brand was more expensive I was expecting it to be a lot better bet it is similar to the less expensive brands. The peppermint syrup from Monin makes the best Christmas seasonal drinks. The flavoring is not too overpowering but still gives plenty of that familiar peppermint taste. It's a staple in our shop during the holidays! I had to do something peppermint for the holidays! I picked up a bottle of the Monin peppermint syrup to add to my coffee and I love it! If you're looking to reproduce the Peppermint Mocha this is it. Using this with the Chocolate Flavoring Syrup or Sauce will get you the results you are looking for. Try this in hot chocolate with a shot of espresso and your in business. Rich Peppermint tastes but not overbearing. Perfect! A really bold flavored peppermint syrup that is great for making coffee drinks that scream holiday cheer. The peppermint is really tasty and awesome in cocoa. The monin peppermint syrup is great for the fall and winter! When you mix it with chocolate it tastes like a peppermint patty. It's on high demand so you'll want to make sure you have it! This Monin peppermint syrup is the perfect peppermint flavor. It does not taste fake and that is a plus. Not too strong and not too weak. I have been buying this for years to make peppermint mochas with my espresso machine. Not so sticky-sweet & full of sharp minty flavor. Just one pump in my drink & suddenly I've got a cool, spicy drink, worthy of some fancy touristy spot. A great peppermint flavoring syrup that is so great and makes a great addition for our bagel shop. A great minty taste and perfect for our Christmas bagel spreads. When the holidays come around every year, we are sure to have this syrup on hand at all of our shops. It makes great peppermint based beverages and our customers keep buying it! Good syrup - no strange aftertaste or chemical taste in our drinks. The mint taste is great. We love this brand and it is of great quality. Very happy with this purchase. This flavoring syrup is perfect for the holiday season! The peppermint taste is good and strong and not too overpowering. It mixes well in hot and cold beverages. Monin syrups are the best! Monin's Peppermint is much better than the other brands. This one is VERY potent and only requires one or two pumps to really make a mocha or hot chocolate minty tasting. The Torani flavor is so weak that we had to add peppermint essential oil to it in order to make it strong enough. Monin's brand is powerful! Their Frosted Mint flavor also can be used in mochas -- its more of a Spearmint flavor. But in our opinion, the Peppermint works better for coffee beverages. The peppermint flavoring syrup is awesome and so delicious. A great addition to make our peppermint mochas. Strong and smooth and very good quality syrup. A strong and bold flavoring syrup that is great for making our peppermint shakes. A great quality and really impressed with its quality and price. A nice strong flavored peppermint flavoring syrup that is great for adding that rush of mint to your coffee or tea. The syrup is great. When i first bought this monin peppermint flavoring syrup, i thought that it would be overpowering. It definitely isnt and i use it in all kinds of things. A lovely holiday inspired flavoring that gets our taste buds in the spirit. The peppermint syrup is delightful and makes a great addition to hot cocoa. A great peppermint flavored syrup that is very minty. A great syrup to use in making our white chocolate peppermint fudge. The syrup is a great consistency as well. If you like Starbuck's peppermint mocha, then save yourself some money and pick up a bottle of Monin's peppermint syrup. Combined with some chocolate - I like Torani's chocolate sauce - and your favorite coffee, you've got a cafe quality drink even at home. Very good, strong peppermint flavor. Works great for a peppermint mocha or a peppermint hot chit chocolate. A little more pricey then the others but I think it's worth it. The Monin premium peppermint syrup is so yummy. I love adding it to my coffee and it really puts me in the holiday spirit. It is a must for adding to hot cocoa as well. Delicious peppermint syrup just in time for the holidays! Sturdy glass bottle, shipped well and easy to use. Just a friendly reminder that pumps used in other brand syrups will not screw on to these bottles, so just remember to snag a few Monin pumps! If you are looking for a solution for flavoring your coffees, iced coffees with peppermint, this product will be a solution but ou will need to pump a little bit more than other brands. Monin syrups are the best! We love their consistency and their flavor. We can't keep enough of this on hand for peppermint mochas in the winter time. The Sarah is not just great for flavoring coffee and hot chocolate I have used it in many baking options in my custom bakery with great results. This peppermint is definitely stronger than the frosted mint, but it does mix better in some drinks! If you are wanting a stronger minty flavor this is def the syrup to go with I actually only used this until I found the other. Premium flavoring syrup with refreshing minty flavor! Great not just for a cocktail but also for a lemonades! Just ad water and lemon and you will get a hero of any party! Best peppermint flavor! I use this often and pair it with chocolate to great an Andes Mint style flavor and it never disappoints! It's fragrant and strong and one of my favorites. Perfect syrup for Peppermint Mochas, Peppermint Hot Chocolates, or even just adding a couple pumps to a regular coffee! The peppermint syrup is a customer favorite during the winter, so I would highly recommend other coffee shops to keep this syrup on hand. You can't go wrong with it! I would suggest trying Monin Syrups while they are on sale right now! We normally bought another brand and thought we would see what the hype was with Monin. While the tastes are pretty much the same, Monin tastes much fresher and the flavor is more authentic (not as much artificial flavors). Try Monin and you wont be disappointed. This one becomes more popular during the holiday season but can be enjoyed throughout the year. It's perfect for making peppermint cocoas and peppermint cookies. Wonderful tasting Monin Peppermint flavoring syrup. Perfect for the upcoming holidays. just a little splash in your coffee and enjoy. Was wrapped really good in shipping. Monin syrups are great. The flavors taste great, are of high quality and most are GMO free. This peppermint has a great flavor compared to other brands. Our customers love it!